With the digitalization of industries, Internet of things (IoT) is one of the key market drivers. As we understand it, IoT, an interconnected continuum of multiple devices and objects that seamlessly integrate advancing technologies of computing and communication such as sensor networks, RFID and Mobile communication result in a mammoth of real-time data flow. This is automatically produced by connected things and sensors that demands the extraction of valuable information for better insights. IoT is strongly believed to be the next generation of the internet that contains billions of objects having emerged with the RFID Technology. RFID is essentially a prerequisite for IoT. “RFID is to IoT what HTML is to the internet. RFID connects the everyday objects to the IoT efficiently and cost-effectively,” explains Mohan Kumar, COO, HexaHash Technologies. Propelling businesses along this steep growth curve and translating data into better insights, Bangalore headquartered HexaHash Technologies facilitate clients with its end-to-end IoT and RFID solutions that meet and exceed client expectations. With highly customizable products, the team of technically adept professionals continually strive to improve the effectiveness, efficiency and ease of use of its comprehensive suite of products through user experience research and design. An innovation-driven company incepted in 2000, the company believes the core of HexaHash lies in its Hexa Innovation Labs, R&D division. Serving various industry verticals, the team has developed robust and innovative IoT and RFID based solutions such as employee tracking, IT asset management, tool tracking and jewellery tracking that have been successfully deployed. HexaHash has had the privilege of working alongside some renowned brands like Landmark Group, Larsen and Toubro, Warehouse Integration network, BlueStone, Artch and HCL Technologies. Hexahash has been chosen by world’s premier research companies to research and develop unique IoT products for the world. 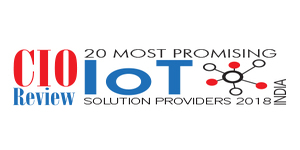 Considering its expertise in IoT domain, many research and development organizations and automation companies approach Hexahash for its innovation oriented technology solutions. While the company may be headquartered in Bangalore, it is easily reachable with its sales office in Mumbai. The technical and support centres are geographically dispersed across Ahmedabad, Mumbai, Chennai, Coimbatore, Hyderabad, Gurgaon and Calcutta.Some of the company’s notable contributions in this domain are Hexahash’s cloud-based integrated Real-Time Locating System (RTLS) solutions that have been designed and developed to streamline processes and optimize the business which in turn will offer greater visibility, increased efficiency, improved productivity and better decision making. “Our RTLS solution provides superior accuracy, excellent product support with the lowest TCO in the market today, making it a better, cost-efficient RFID RTLS Solution in the world,” informs Mohan. Yet another exciting innovation is its novel voice assistant, Hexabot, which is embedded in the IoT and RFID platform programmed to empower the automation industry. “With Hexabot, organizations can avail real-time tracking, monitoring and analysis of employees, assets or environment for better productivity and more growth,” reveals Mohan. Additionally, it offers low-cost integration and high-end performance ensuring unprecedented user productivity and rapid ROI. Aware that certain security threats may impede the potential of these technologies, the team smartly incorporates security by designs in its IoT systems to mitigate any security issues. Having etched its name amidst one of the top solution providers in this domain, the team endeavours to continuously deliver the highest quality of products and services. Hexahash has also launched an organization called Centrinno (Center of Research & Innovation for SME) to aid small and medium organizations in using technologies to improve their productivity and business operational efficiency. Small and Large enterprises can reach Centrinno (www.centrinno.org) to define and develop a new product or optimize existing processes.